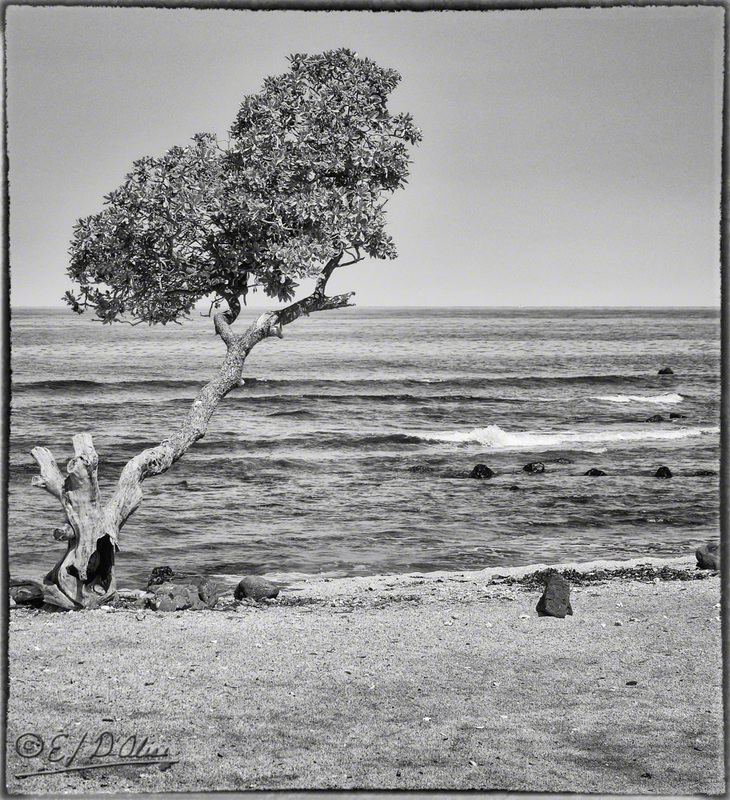 In my previous two posts, I explored what Google Nik Collection Silver Efx Pro2 could do with regard to photos of trees. At the end of those, I thought I pretty much knew which photo I would submit to Monochrome Madness . . . and then, I remembered other photos of trees. The following are a combination of Lightroom, Silver Efx Pro 2, On1 Effects 10.5, DxO Film Pack 5, and . . . no, that’s it; just those. No one photo is just one of those; I mixed-and-matched to get versions of the photos that I like. I won’t be showing the originals because I don’t think most people care. I mean, it’s a bit like having a cook show you the ingredients that make up your meal; it might be of interest to some, but most just want to consume the meal. Heck, they often don’t even care — or what to know — who prepared their food. I suppose sometimes it’s better to not know. The same is true here, so here we go . . . I live on an island . . . why all of the shots in this post are by the water. 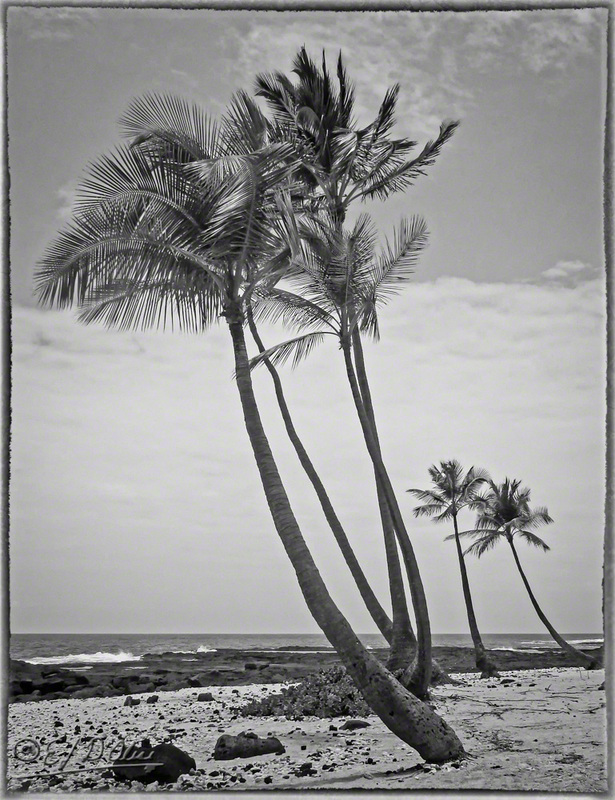 We begin with the quintessential tropical island shot. Yes, I’m numbering them because another poll is coming your way at the bottom of the post. It’s because I had such a huge response in the last post . . . two people voted. Anyway, there’s no SmugMug gallery but you can click on the photos for a larger version and there will be a gallery at the end of the post. The first four photos were taken with my Nikon P900. The last six were captured using the full rig (Nikon D7000 with Sigma 17-50mm f/2.8). I suggest it every time, but hardly anyone listens . . . the larger versions are better than what WordPress puts in here. 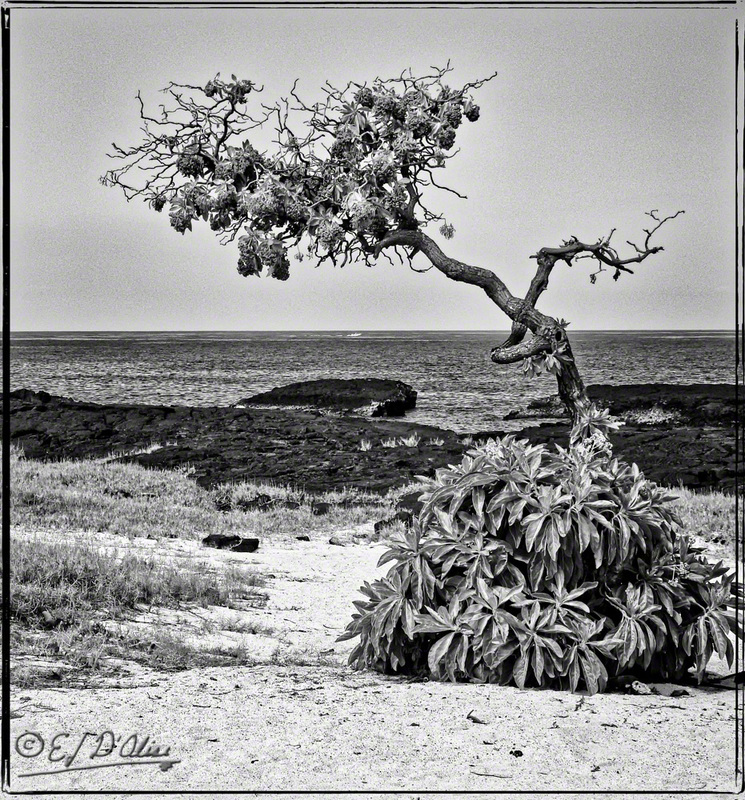 Anyway, while most people think of palms when imagining walking on a beach in Hawaiʻi, the truth is that palms are not native to the island. Consequently, the resorts are where you find most palms (as in the shot above) and in people’s yards. What you see when away from cultivated areas, are these trees . . . The above shot is not very inspiring and I doubt it will get many votes . . . how about this next one? I think that’s a better setting and composition, but it’s still difficult showing these trees in a good light . . . except, sometimes one gets lucky. That’s probably our most favorite tree. It’s at the Old Kona Airport, where we walk, and we sit with that view in front of us (minus the sun) after we’re done walking and stop to eat a snack before heading to the gym. Now, all of those are fine trees But I like me drama in my B&W photos. I want a punch (not literally) to the photo. 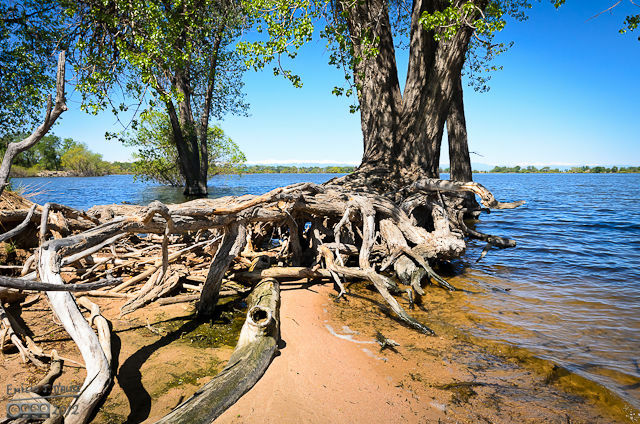 That’s a composite of four photos that were stitched in Photoshop, processed with DxO Film Pack, then Silver Efx Pro, and then tweaked in Lightroom. 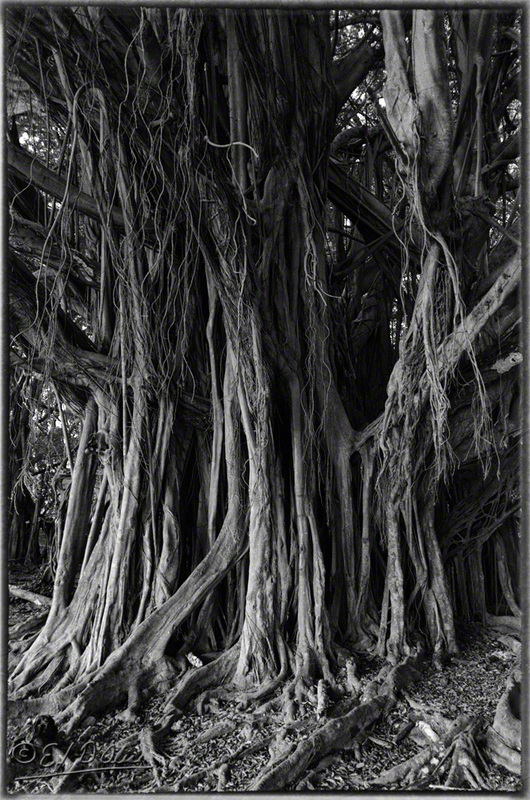 I have two shots of the same banyan tree that I thought might be candidates. I like the shots, but I’m not sure about the level of “drama” to the shots. 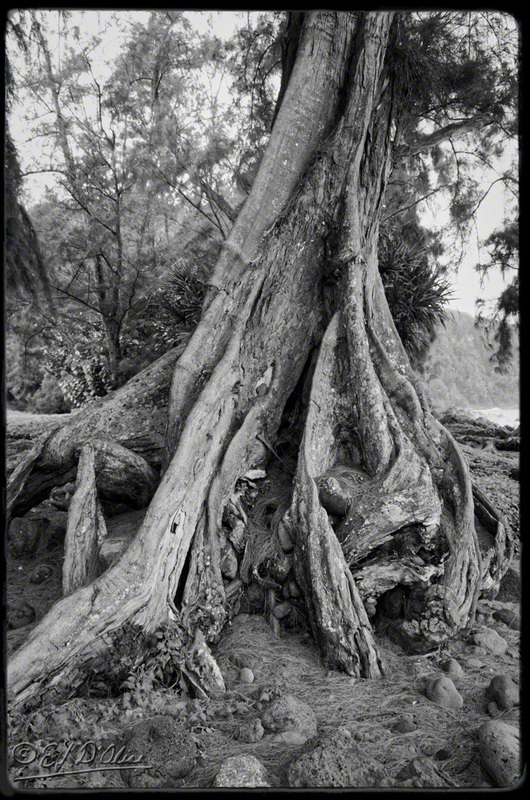 They are imposing trees (this one is near Rainbow Falls, in Hilo) but difficult to capture well because of their size. Those shots aimed more at showcasing the aerial roots than showing the tree. OK, OK . . . I’m just teasing my readers. For drama and visual impact, I knew what trees I wanted to use. 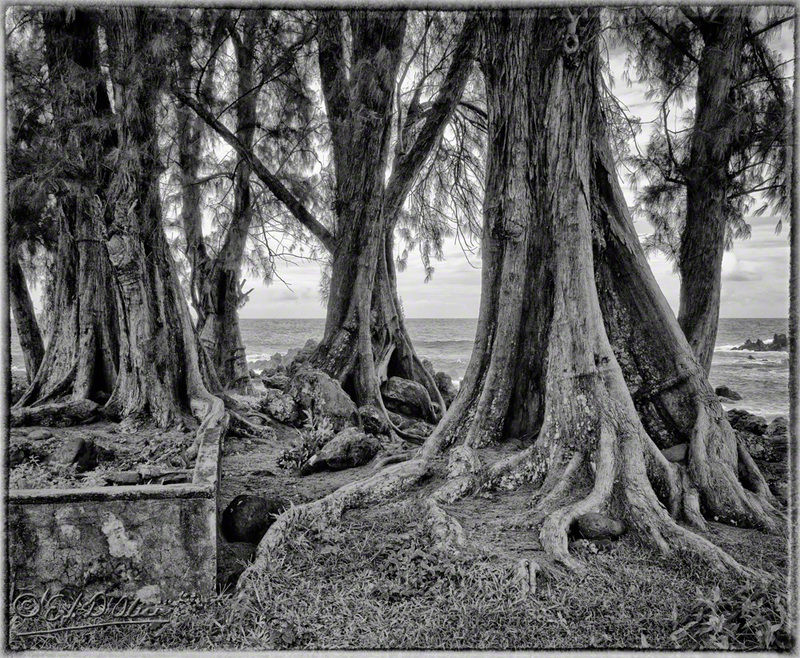 These trees are at the Laupahoehoe Beach Park showcased in THIS post. Except, I only showed the waves in that post . . . my mistake. However, they did appear in passing in THIS post. Anyway, that’s fairly dramatic, but I like this next one a tad more; do you? I think it’s the wall that does it for me, although the rocks on the previous one are also impressive. Because it’s landscape, it will look better if you click on it for the larger view. As far as composition, tonality, details, and subject matter, I thought this next one is in the running for the best of the series. Opinions vary, of course. And, there you have it; ten photos for you to rate. The poll allows for up to three votes per person. This entry was posted in Black and White, Photography Stuff and tagged Black and White Photographs, Photography, photography stuff, post-processing. Bookmark the permalink. Trees are my favorite subjects to photograph because they seldom complain when you take a crappy photo of them. Yeah . . . they never ask you to leaf them alone. I chose 8. I like the composition with the hanging branches. Thank you pkpotd; a good choice for some strong elements especially in the foreground. Some great photos, Disperser, especially #5 which just blew me away — a beautiful picture! 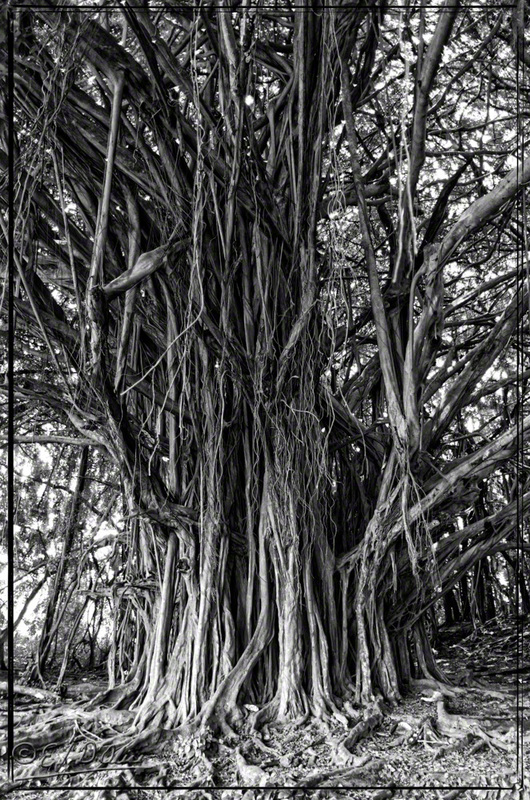 I also enjoyed viewing the banyan tree details in #6 and #7 which would have been my second and third choices but then I decided to vote for only one photo in this poll. That is probably the most elegant photo there by virtue of being smooth as well as the gentle curves. #4 is it, for me. On the previous post, I was confident of my then choice. Now, I’m vacillating between four photos. The thing is, they are all very different and I like them for different reasons. #4 seems to be leading the pack, the sun’s positioning likely making the photo a lot more than what it would be without it. I think so from what I saw but those trees in the previous, the fan-like ones are especially eye-catching too. I couldn’t pick a favorite between #5 (found it completely stunning! 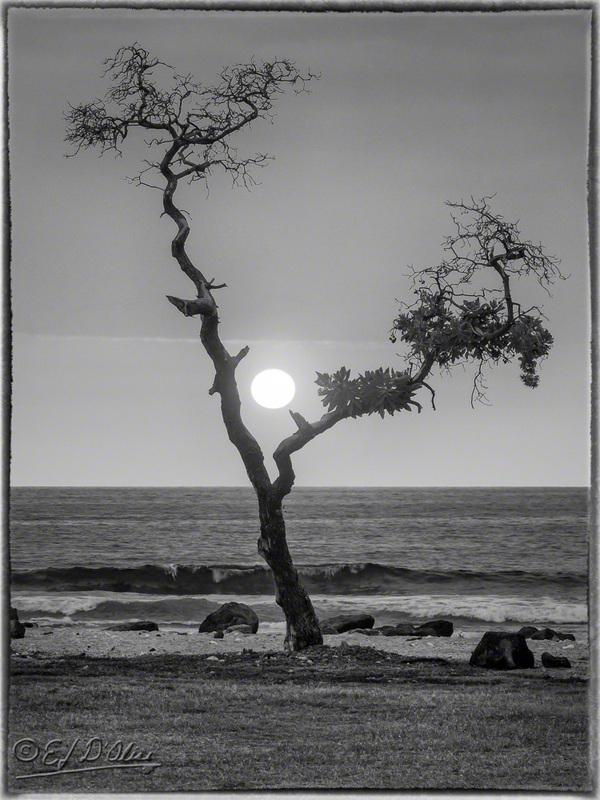 ), #8 (this one says ‘tree’ the best) and #9 (excellent composition!!!). As I keep comparing them, I seem to return to #9 . . .
Like I said above, this threw a monkey wrench into what I thought was a done deal as far as a decision. I suppose it’s better to have too many choices than not enough. 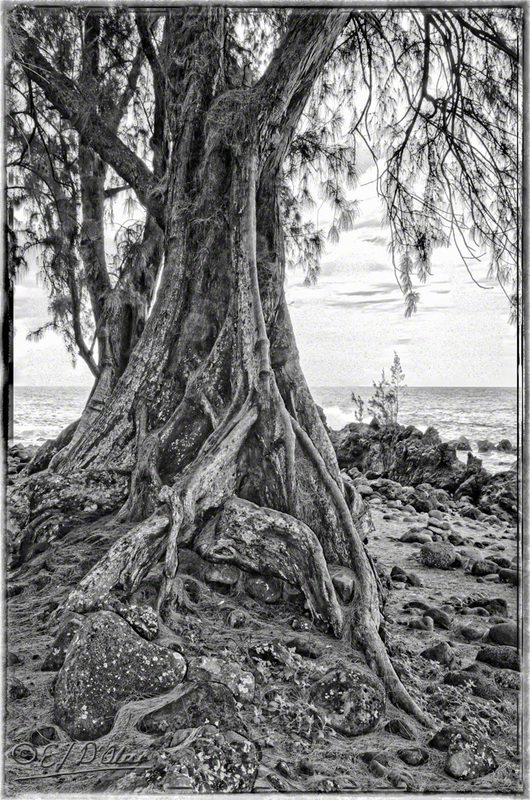 I love the roots on these old trees. Ha! I take a lot of trees too!! Great images Emilio. Thanks, tdm. Some root systems are quite intriguing. Soooooooooooooooooo hard to pick a favorite! So I picked 3 (you said we could)! :-) #9, #4 and #3! Wow, the trees you shared are cool! I love how they are so unique and have their own style! PS…I’ve hugged trees before! One time, in Yosemite 10 of us joined hands, circled around and hugged a BIG tree! Imagine how difficult it’s for me. I’m sure the tree appreciated it. Probably didn’t say anything, but they’re like that . . . kind of quiet. Maybe Coco is setting an example for you . . . Thanks for voting. It’s the idea of compulsory voting here in AUSTRALIA that gets me to do my duty, in this case go back, view all the candidates and vote for your preferences in order, Yes we do have a compulsory preferential voting system that works. As you see it even gets me paying proper attention to your stuff! Wow . . . that’s some pretty strong compulsory laws to apply half a world away. As for it getting you to pay attention to my stuff, I have reasons to doubt that. It’s been my experience you are particular about what you choose to pay attention to. It’s usually something that favors grasping at tenuous arguments for the superiority of Brits (first) and Aussies (second) and even then, it involves mischaracterizations and willful misinterpretation of facts. I don’t think that’s the case for all Brits and Aussies as the vast majority of my interactions with them do not conform to our typical interactions.
. . . I assume I trigger that kind of response in some people . . . Not sure yet if I’m proud of that or consider it a nuisance. Thank you. That seems to be the favorite. Regardless which I choose, the others will eventually make it to Leanne’s weekly MM.